dgwarp: Raster conversion package to convert between different projections and datums. It is command-driven, and requires the know-how of the syntax. LUPMIS system accesses it automatically. 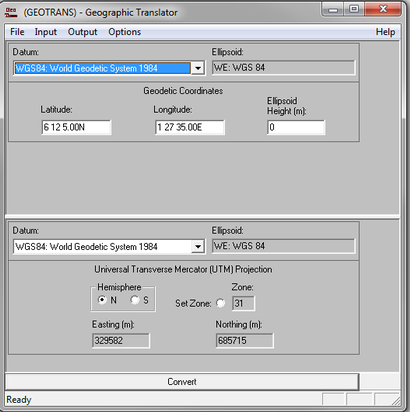 Geographic Translater GeoTrans 95 is a small converter of point coordinates between different projections and datums, explained in Chapter 5.1.3. It can be invoked from the Map Maker top menu, or from the LUPMIS Drawing Tools, or from the desktop (link to file geotrans95.exe). E00 utility to convert old E00 GIS format of ESRI to new format (see Annex 14.2). It might be required only in exceptional cases and can be requested from TCPD-HQ-GIS. EGP2SHP utility to convert GPS data to SHP format and then to any GIS. It might be required only in exceptional cases. GPSBabel converts GPS data between different GPS format. kml2shp and shp2kml are conversions programs to change between ESRI shape formats of GIS files and kml format. IrfanView is a powerful graphics package, strongly recommended for all LUPMIS users. LUPMIS Tools use IrfanView in the background at some operations. The installation (from file iview427_setup.exe in folder C:\LUPMIS\LUPMISPrograms\GISUtilities\Viewer) and the familiarization with IrfanView is strongly recommended. XnView is another useful graphics package. Adobe Reader is a standard PDF utility to read or print PDF documents, useful for example for printing Demand Notices from the IGF Tools (see Chapter 8.6.3.3). Google Earth is very useful to view the GIS data. It can be downloaded from the internet. Omniformat is a general converter between graphics formats, particularly for batch conversion of all graphics files of the selected format within a folder. GPS driver: GPS driver for Garmin in file USBDrivers_23.exe in folder C:\LUPMIS\LUPMISPrograms\GISUtilities\Drivers. For the download of data from some Garmin GPS, it has to be installed (see Annex 1.3). You might also have to install gpsu499setup.exe (in folder C:\LUPMIS\LUPMISPrograms\GISUtilities\GPSUtility). 7-zip: Data compression software. It has the same functionality as WinZip or WinRar with the same performance or even better. This should be installed in your computer, if it is not already done. 14aren: Small file rename utility, useful for data administrators. No need to install, just run it. 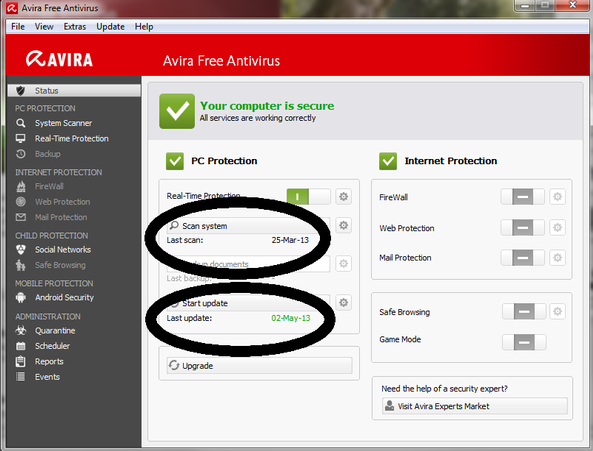 AntiVir: Antivirus protection (not on all LUPMIS packages). If it is not attached to the LUPMIS installation, you can download from the internet at www.antivir.com. Install it, let the 'update' run and then scan the system, which might take some time.